It is a very rare thing to have the privilege of taking a boat from a design on paper through a top-end custom build and on to its final destination. 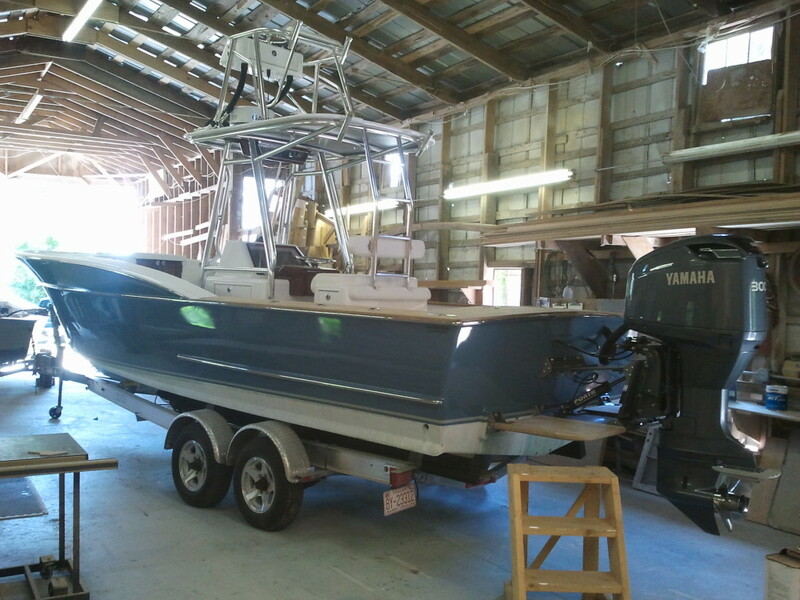 I was lucky enough to build a high-end center console Carolina sportfishing boat for a friend who basically gave me carte blanche on the decision making. 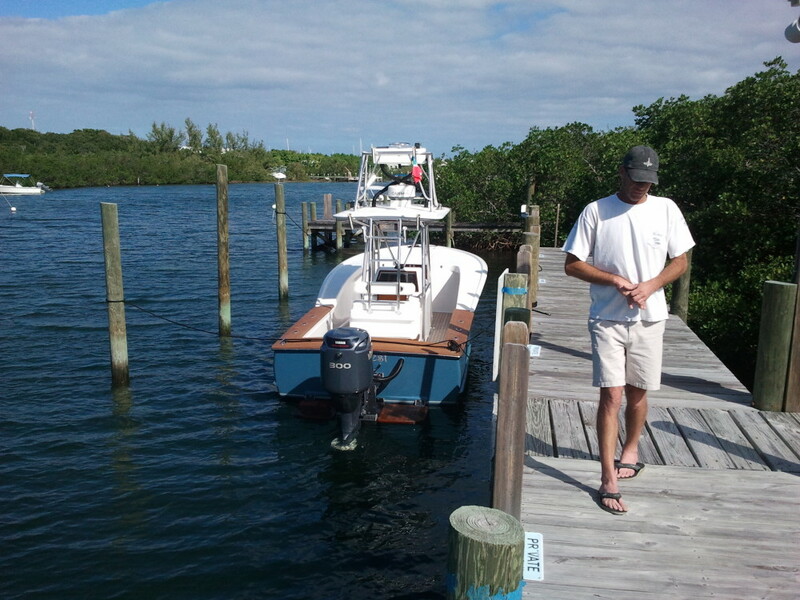 I had already built the hull, a 28′, when my friend and his wife decided they wanted to buy it to keep in Hopetown in Abaco, Bahamas. 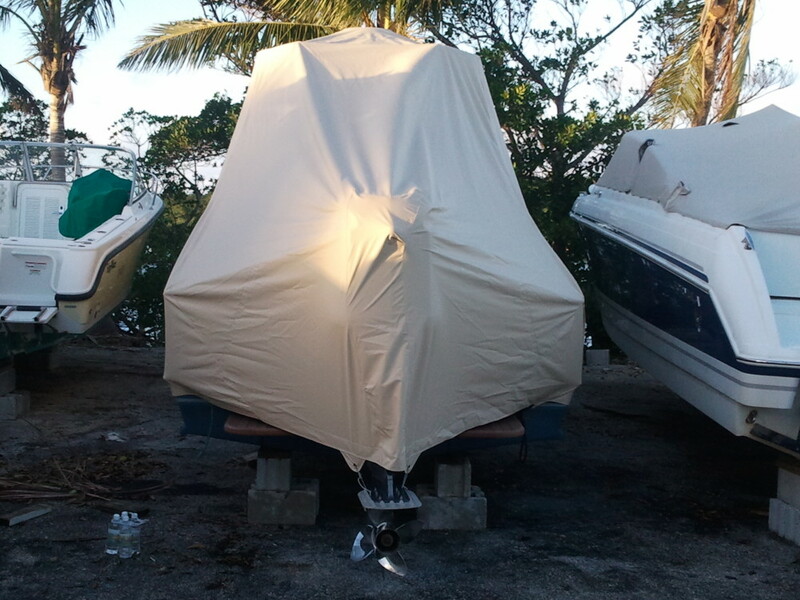 It turned out that the owner wanted all the teak that a boat can have except for the toe rail. This was fine with me because I really enjoy putting the icing on the cake, as it were. The boat was also fit with a tower or upper steering station, which is great for seeing fish or coral heads in the islands. “Harvest” in the Harrison Boatworks shop at Sunnyside on Roanoke Island. 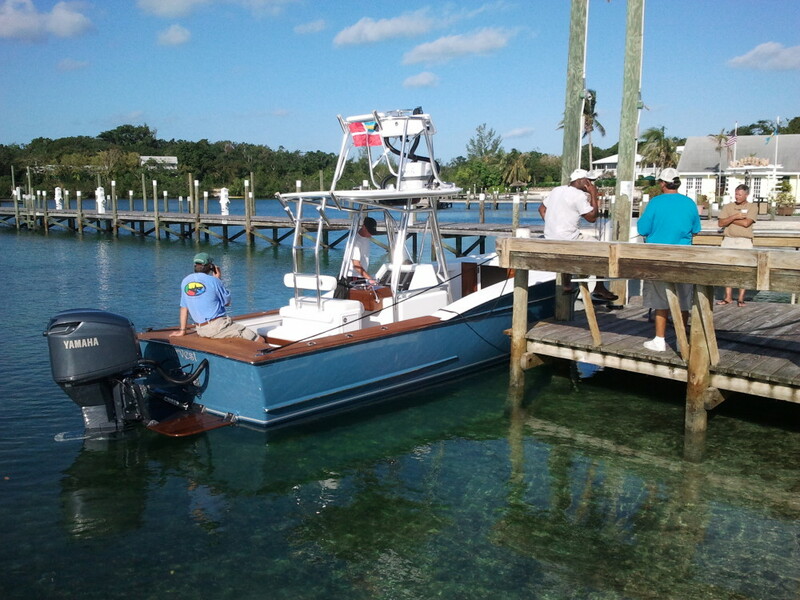 I finished the boat a year and a half ago and my mechanical engineer and partner, Bob Vlcek, and I were able to take the boat to three boat shows before the owner took delivery. The boat was well received at the shows. Many people commented that it was the prettiest boat they had seen at the show, which made me feel good, of course. I actually kept the boat for a while. The owner was trying to finalize some plans in Hopetown and only came to the Outer Banks occasionally to use it. 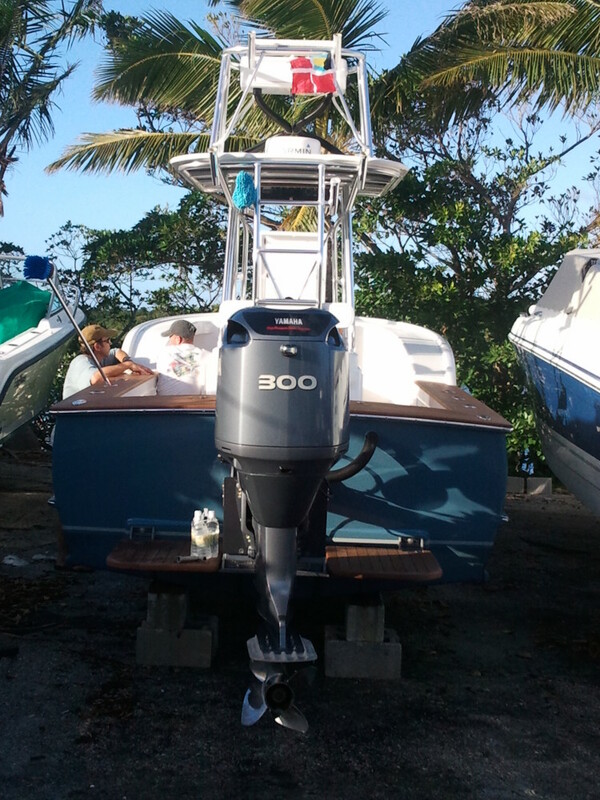 But after plenty of exposure and many sea trials and fishing trips with family and friends, it was finally time to let her go. Bob and I made a plan with the owner to deliver this 28′, which the owners had named “Harvest,” from Roanoke Island to Hopetown over Thanksgiving week of 2011. The plan was to trailer it to West Palm Beach, meet the owner in West Palm Beach and then run her over to the Bahamas. Sounds simple and straight-forward, right? Well… There were quite a few logistics involved. Number one concern was hauling a 28′ boat at 70 mph down I-95 in a half-ton Chevy with 235,000 miles on it. But the biggest factor of all to worry about was the weather. When we got to West Palm Beach, we learned that no one had made the crossing to the Bahamas in five weeks because of prevailing NE winds. All we could do was hope for the best and pray that we wouldn’t be holed up in a hotel room for days or weeks waiting for the weather window. Luckily, it turned out that the weather broke the day after we arrived. 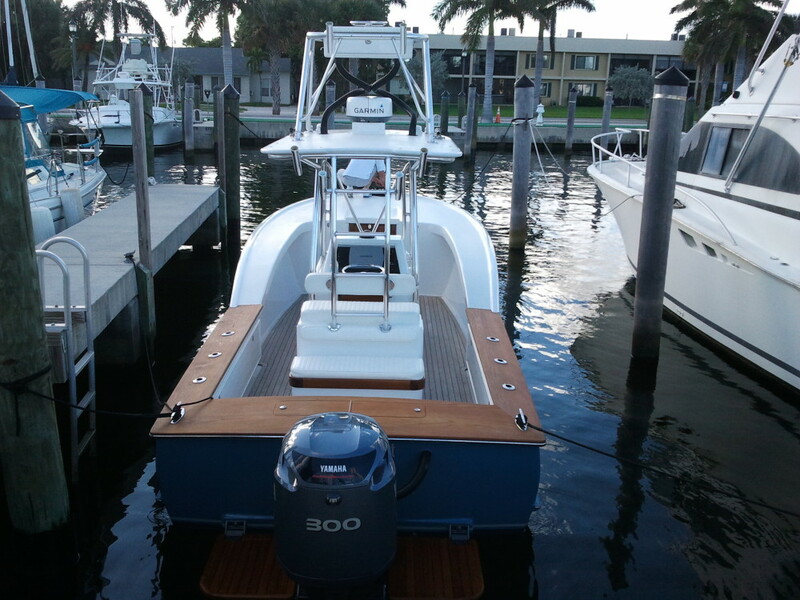 We hit a West Marine for a late-night shopping spree and made plans for the departure the next morning. Of course there is always a passport issue, and we had to wait for Bob’s passport to be expedited straight to West Palm Beach. We had to sit around and wait until 9:30 a.m. for the delivery, which really got the nerves going — as if a 192-mile passage wasn’t enough to think about. I was concerned about all kinds of mechanical failures, engines, batteries, electronics, etc. Every bad scenario had been racing through my head for weeks. Deep down I knew it would be OK, but I just wanted to be super-prepared for this ocean crossing. After we received the passport we were on our way, past the Sailfish Marina and all the legendary Merritts and Ryboviches, to Lake Worth Inlet. We were met with immediate swells and spray, which took a while to get used to. It was about 3 to 4 feet with a southeast chop. Not bad conditions but not great. Everything went well and I was relieved when we passed the mid-way point, which was about 27 miles from West End, Bahamas. We were making about 17 or 18 knots so we made it to West End in about 3.5 to 4 hours. As we entered the Little Bahama Bank, sea conditions flattened out and we were able to comfortably cruise at 28 or 29 knots, while sitting or walking around the boat in comfort. Three or four hours later we made it Spanish Cay. We cruised on to Green Turtle and made it there just at sunset. We pulled up to the dock and got a couple of rooms for the night. We could finally relax. Dinner was very good and there was a band and a considerable amount of people for this place. About half were other cruisers in the little harbor. Taking on fuel at Green Turtle Cay. Captain Bob Vlcek at the docks after a successful crossing. The next morning we had a leisurely, huge breakfast, took on some fuel and were on our way. Unfortunately for us, the wind had gone back to the north and made the remaining four hours fairly rough. With 6-foot seas that were coming from every direction, we really put that boat to the test. I was very happy to experience how she took the nasty conditions. 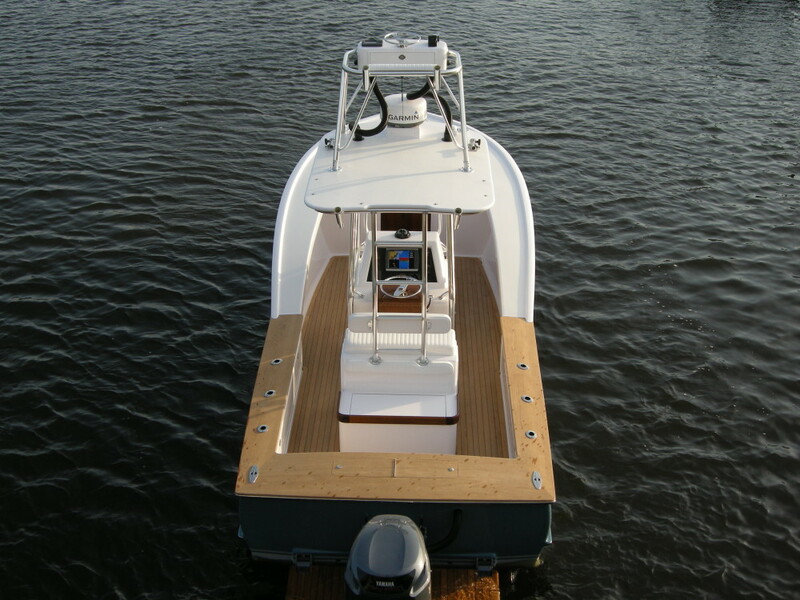 When taking waves from multiple directions, the full transom gave a real sense of security. Although our cruise speed was reduced quite a bit, we were still able to move safely ahead, making good progress. Soon we could see Man Of War Cay and then Elbow Cay and Hopetown. A huge relief and a great delivery. 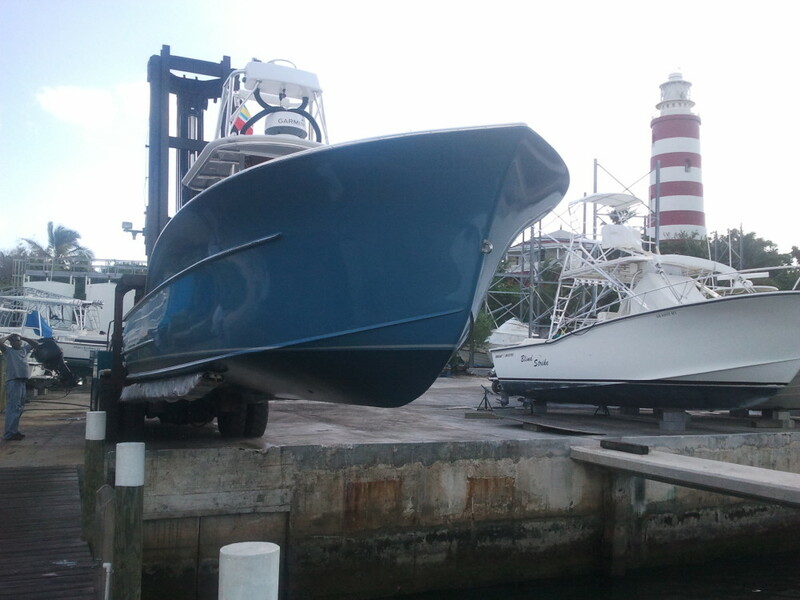 We hauled the boat out and blocked her up in the yard at Lighthouse Marina in Hopetown. That evening we were eating Thanksgiving dinner with the owners and their family. I realized what a joy and a privilege it was to bring this vessel to life and to be able to put her to the test on a delivery to such a beautiful place. 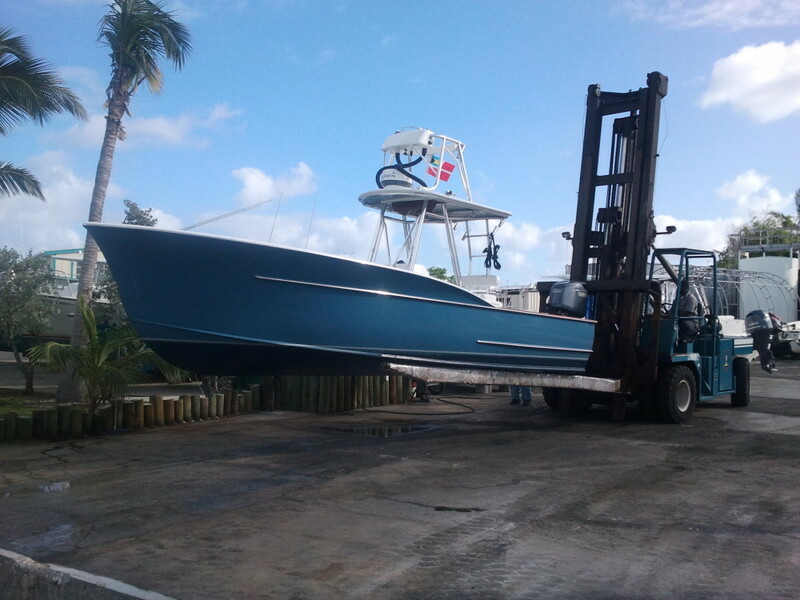 Hauling out at Lighthouse Marina, where “Harvest” will reside. Looks like the forks are barely long enough. Washed down and blocked up. Covered up and cinched down. Journey complete.